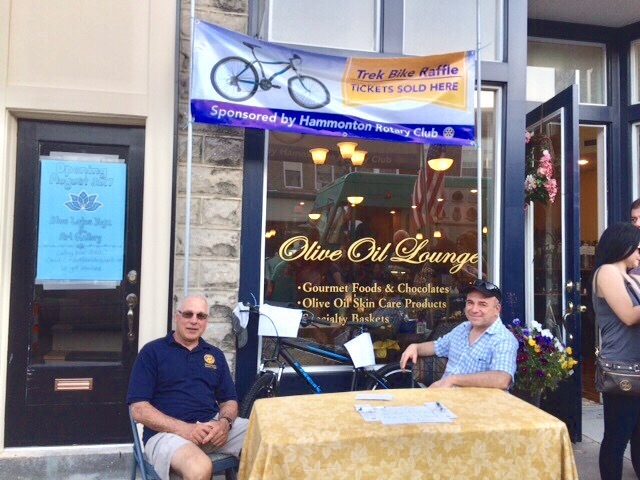 Hammonton Rotary Club President Donald DeFiccio, left, and Vice President Tony Pagano will be among the Rotarians selling bicycle raffle tickets during Feast of Our Lady of Mt. Carmel July 11-16. The Hammonton Rotary Club is raffling off two Trek mountain bikes during the Mt. Carmel Festival to raise money for its charitable projects. The drawing will take place 11 p.m. Sunday, July 16. The club will have a table set up for ticket sales during feast week, July 11-16. The purchase of one $5 raffle ticket buys the chance to win one of two 2017 Trek mountain bikes with a retail value of $250 each. Proceeds benefit the Hammonton Rotary Club Scholarship Program and the club’s other local and worldwide community service programs. Tickets are available from any Hammonton Rotary member. Email info@hammontonrotary.org or see http://www.hammontonrotary.org to learn more about the club. You can also learn more on Facebook. Posted in News.Tagged Events, Mt. Carmel.